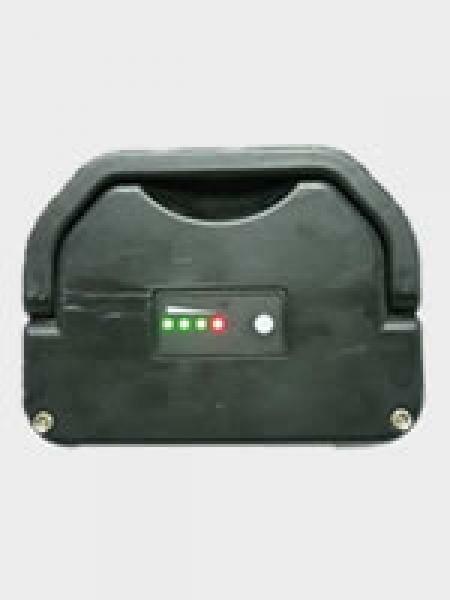 High Capacity: 36V 8.4Ah (or 300 Watt-hour), equivalent to a 12V 25Ah Sealed Lead Acid battery. Small Size: 8.5" x 4.4" X 3", can fit in many different places. 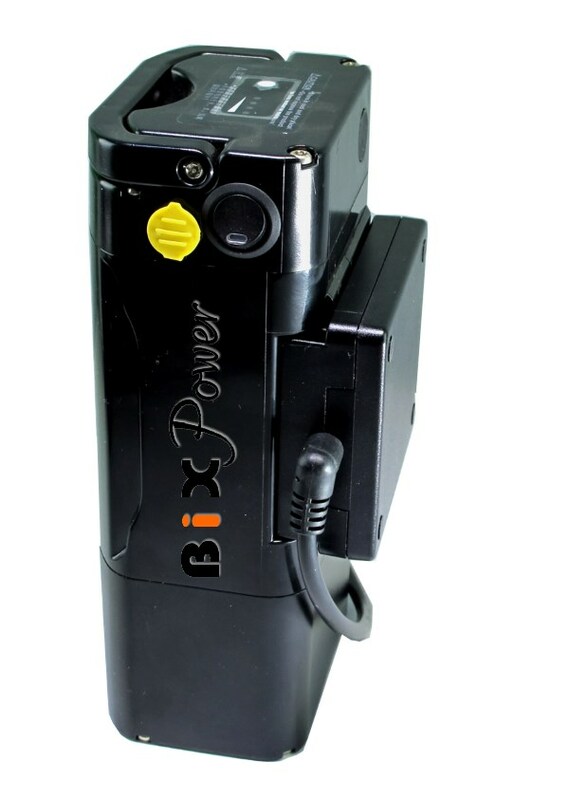 Very Powerful: continuous output up to 390-460W, maximum burst output up to 540W. High Quality: Made with high quality Panasonic Lithium Ion cells. High Durability: Water-resistant and firm ABS plastic casing. The internal pack is stabilized by braces that can avoiding mechanical accidents caused by vibration. High Safety: Built-in PCB protection to prevent short circuit, over-current, over-heat, over-charge, over-discharge. This battery is for professional users with advanced electric knowledge only. 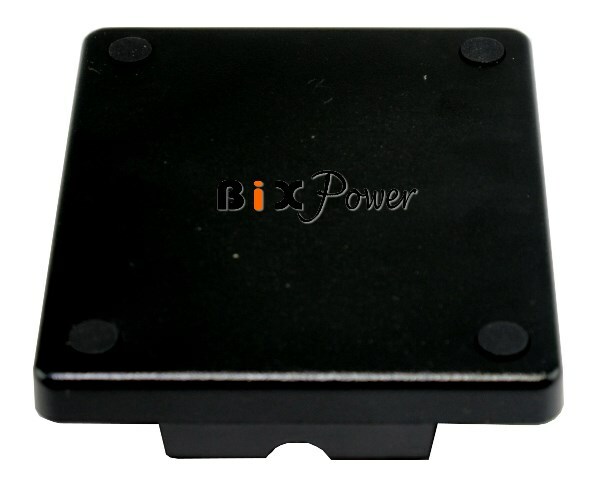 Maximum Burst Output Power ( up to 10 minutes) Current: 15A (Output Power: 450W~540W). This battery is recommended for using with 400W or less power motors. 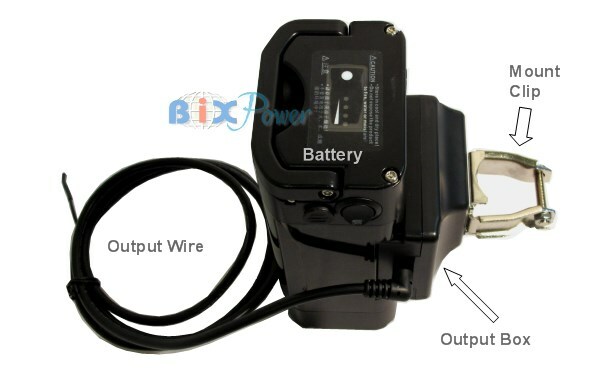 If your e-bike motor needs more than 400W power, this battery may not work well because it may not supply enough power. Water-resistant and firm ABS plastic casing. 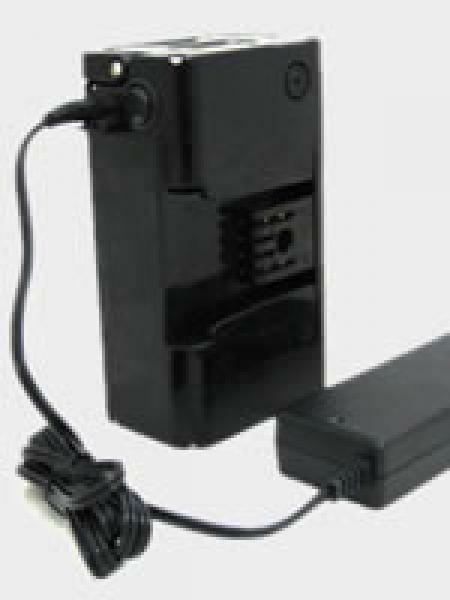 Prevent short circuit, over-current, over-heat, over-charge, over-discharge. The internal pack is stabilized by braces, thereby avoiding mechanical accidents caused by vibration. Using a lithium-ion battery offers many advantages over older SLA (Sealed Lead Acid) batteries because of lithium-ion's high energy density, small size, and low weight. A typical lithium-ion battery has 1/4 of the weight and is 1/2 of the size of a same capacity traditional heavy bulky Sealed Lead Acid battery. Suffer a big affection in by output current. 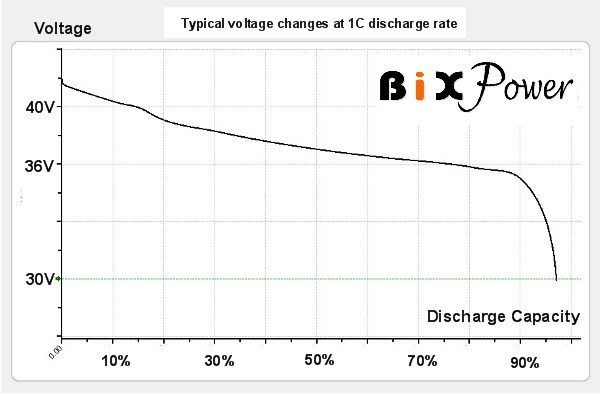 Capacity will be much smaller than rated capacity when output current is large. Lithium-ion batteries are generally not considered an environmental hazard because they do not contain lithium metal. The United States government labels them as non-hazardous waste and does not oppose them being discarded together with the trash that makes up the local waste stream. 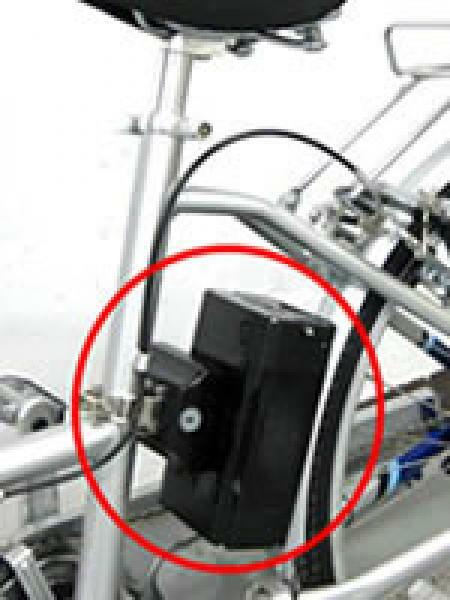 The included Output Box can be used as a battery holder, which you can mount on the frame vertically or horizontally. 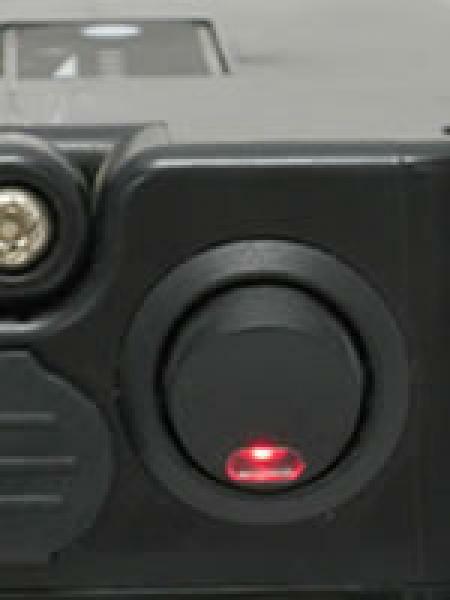 The battery then can slide on /off to the output box and be locked in place with the key. It is designed for multi-direction installation. 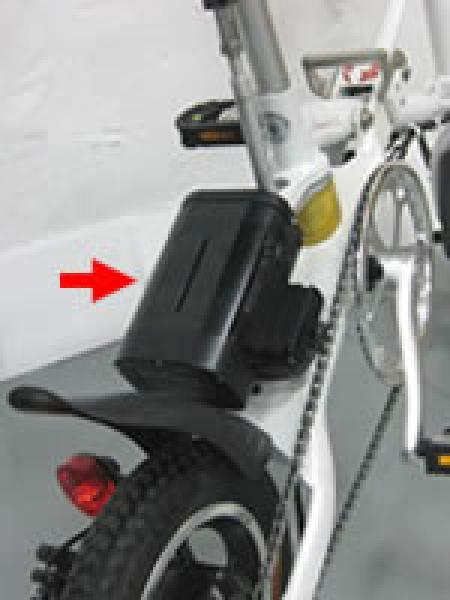 You can change the position of battery (vertically / horizontally) by adjusting the clamp. The Four-level LED indicates current power status. 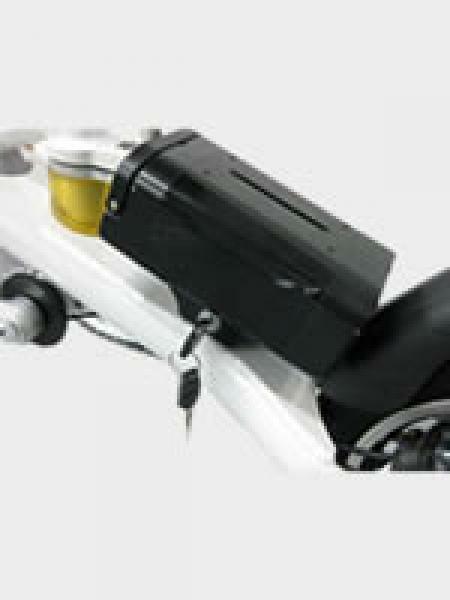 Battery can be recharged either by fastening on the bike or by itself with the provided AC adapter. The LED (at the power button controls on/off of the battery) glows when power is on. 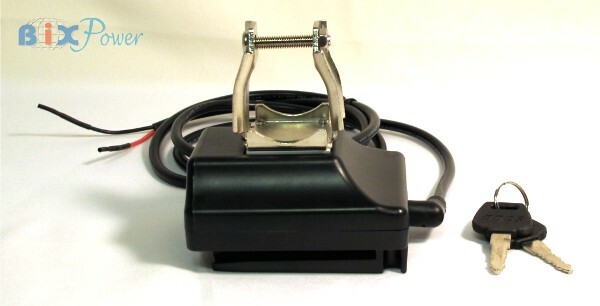 The key lock is used to fix the battery onto the holder. 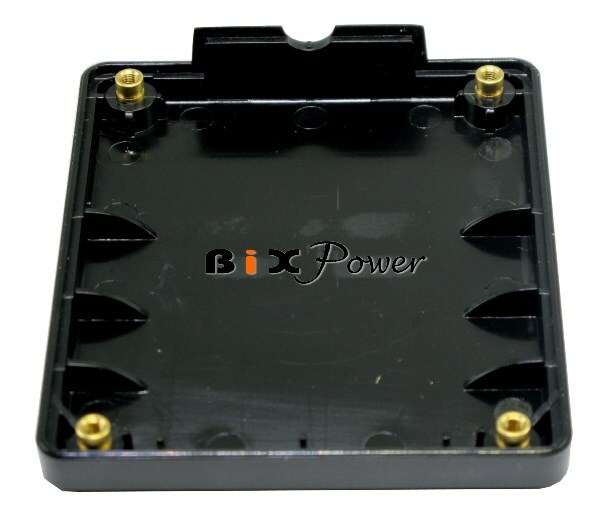 The optional Output Box is designed for multi-direction installation. 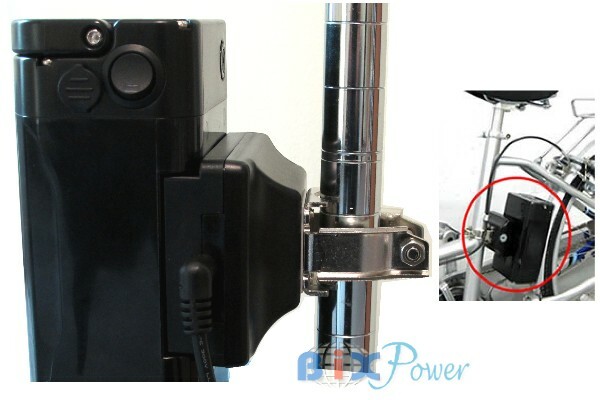 User can change the position of battery (vertically / horizontally) by adjusting the clamp. The battery comes with a AC charger and output box. 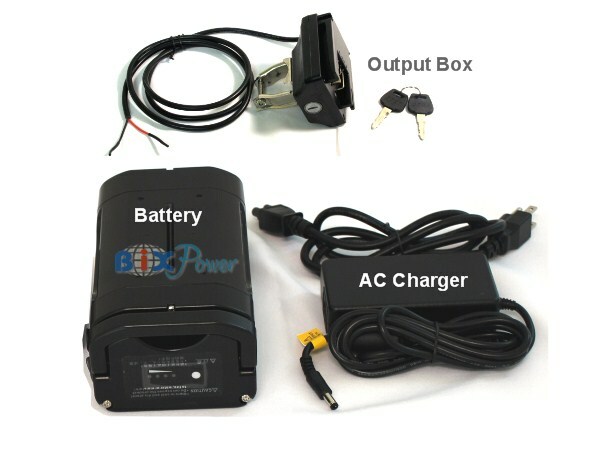 The AC charger can charge the battery from any 100-240V AC power source. Warranty: One Year limited warranty. The one year limited warranty covers manufacturing and quality defects only. Please note that batteries wear out with use. The amount of charge a battery can hold gradually decreases due to usage and aging, which is normal, and this is not the issue covered by warranty.